So between comments and emails, I wanted to expand a bit on what I wrote yesterday. Fix-It Grammar include five different stories that progress in difficulty. The idea is that four days a week for 33 weeks, the child fixes one passage from the story. That passage contains a vocabulary word, and some grammar errors. The child copies the story passage, fixing grammar and punctuation. The child also looks up the vocabulary word and writes out the definition that fits how the word is used in this passage. Some weeks focus on things like subject/verb agreement. Some focus on frequently misused words. Since my kids are using IEW's writing program, they also get the opportunity to identify sentence openers and dress-ups. 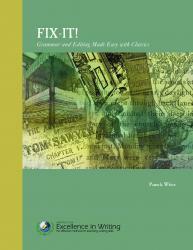 Fix-It Grammar comes as a book, and a set of pdf files of the student pages. So one purchase, and I'm set for all my kids for up to five years. Tom Sawyer, intended for grades 3-6, will be done by my kids in grades 4, 6 and 8. Frog Prince, intended for grades 4-8, will be done my my guys in grades 5, 7, and 9. The Little Mermaid, intended for grades 6-9, will be done by my kids in grades 6, 8 and 10. The King and the Discommodious Pea, intended for grades 7-10, will be done by children in grades 7, 9 and 11. Sir Gawain and the Green Knight, intended for grades 9-12, will be used by my boys in grades 8, 10 and 12. And then I repeat the cycle, starting with Tom Sawyer for my 4th and 6th graders, and probably skipping a year in there somewhere so that Trina will be older when she gets to the final story. This puts Connor as being "too old" by a year for stories 2, 3 and 4, and by two years for story 1. The only story he gets "right" is the final one. William is solidly in the grade range all the way through. And Thomas is at the younger end of the recommended grade range for all but the last year. Or, as I still have at least two days to decide, I may skip Tom Sawyer and start all three with Frog Prince. But that would mean skipping a year later, or having Thomas always too young. I think I'd prefer to err on the side of my kids being "too old" for this. This program definitely is not in the "too expensive" camp. For $30, it is a program I'm currently planning to use every year for the next decade, with two or three children at a time. Additional costs will be a printout of the student pages, a notebook for each child each year, and probably a couple extra dry erase pens per year. Disclaimer: I purchased this product myself, and have not actually USED it yet with my children. I've read the introductory material, and read a pretty good chunk of the work for the first story. My oldest has looked over some of the material and has signed on for doing this. But seeing as my kids haven't used it yet, take everything I say with that in mind. Happy New Years! Here's to a fabulous new year!